Can't ever finish any drawing in the given time limit. I'm trying to get the general idea right for now, not going into details too much. The waist and pelvis areas are most problematic for me I guess, tried to substitute the pelvis discs with just a block and I think it worked better in some of the drawings, but I think I should try to use the discs either way, since their idea is closer to actual skeleton. 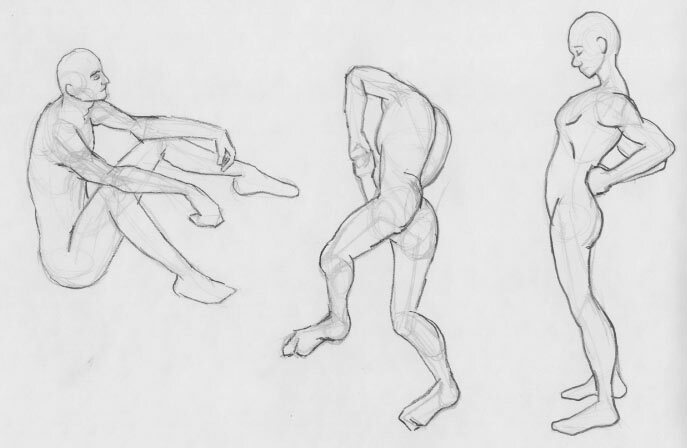 Anatomy aside, I still can't get a good feel of 3d forms in general - when drawing simple 3d primitives I still end up with distortion and crooked angles, and any attempts at foreshortening without any reference end up in total failures Any advice on this? I was trying the 2nd website wishie posted, but all the times seem to be off for me. 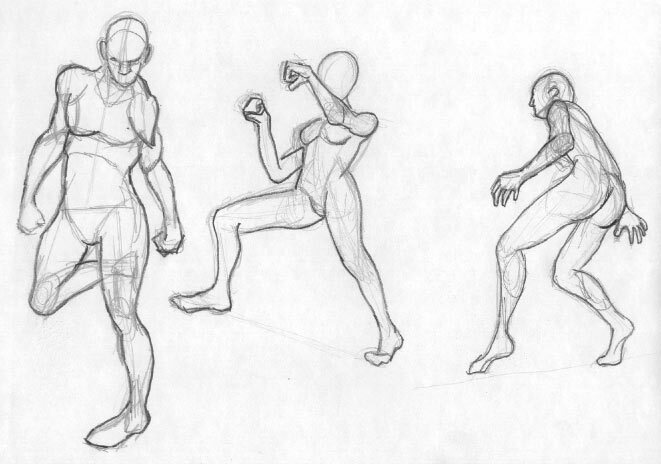 atleast for the longer poses I noticed them only lasting about half of what theyre supposed to. Anyone else have this issue? MAybe Ill post my stuff later but I cant scan it right now. I guess it just takes a lot of time and practice until one can accurately render 3D volumes from scratch. I too am struggling with that. 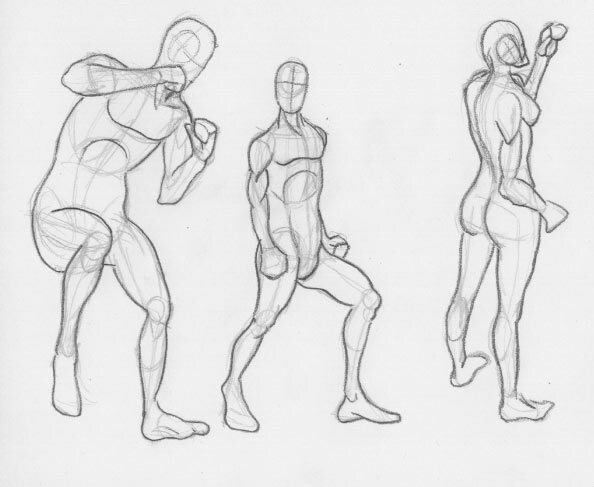 For foreshortening without reference, there's a constructional approach in which you draw the object from a simple side view first and then use parallel lines emerging from key points to be able to tell where these key points would end up when foreshortening the depth of the side view into a new depth which goes "into the paper". 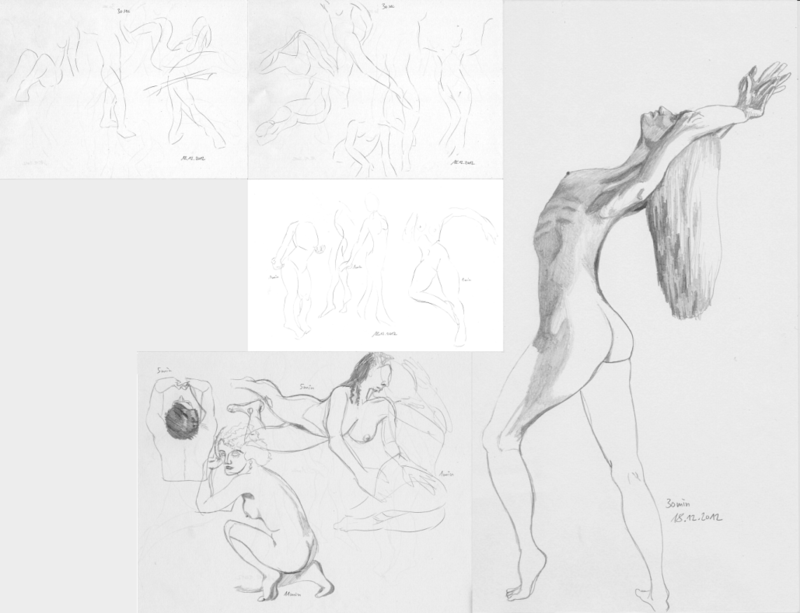 Had not measured the times while I was drawing but sometimes it felt like some poses didn't stay as long as they should have which I attributed to losing the feeling for time while drawing... odd. Been slacking over the holidays, slowly resuming studies. New year, same problem, the time is never sufficient to make correct measurements and always runs out while I'm in the middle of the rendering phase. Does anyone have any good resources targeted towards facial anatomy construction? I'm finding posemaniacs wonderful in covering many other aspects but definitely not that. I've definitely produced a few pages of studies so far, but nothing huge -- mostly just modeling certain parts of the body that I don't understand at all in different angles, such as ears. Hopefully I'll soon have something worth C+C here this week. Lachie, heh, has she been posing for that site? 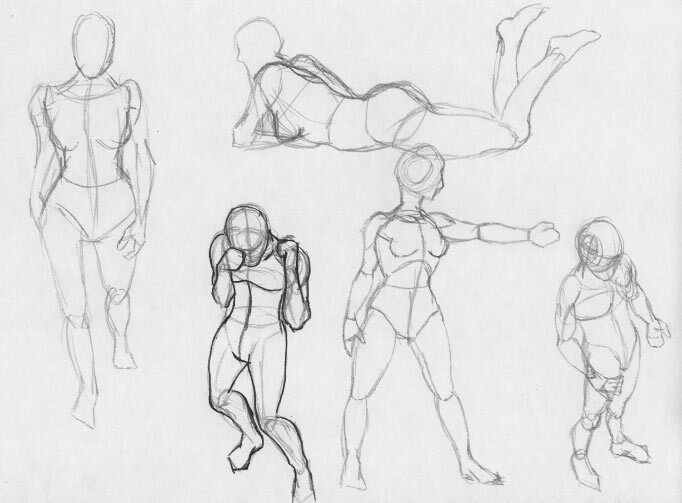 Ashbad, read Andrew Loomis "Drawing The Head And Hands" or start with "Fun With A Pencil" for a less technical approach towards head/face construction. Todays doodles (the time limit, it does not like me but I think I'm actually making progress though when I compare the logged times and earlier doodles, it seems that my doodles in the 5 to 11 minute range are getting better... better as in, more correct (still off but more correct) in less time). These copies are somehow distracting me a bit from the goal of gaining a better understanding of bulk/volumes though since I'm not constructing and just trying to quickly capture what is seen within the given time limit.